"The point is that Krishna appeared as the full fledged Personality of Godhead. But Ramachandra appeared as an ideal king. Therefore in the Lila of Ramachandra, principles of morality and ethics as they are to be followed by ideal king and ruler was followed. In the same sense, He banished Sita in order to prove Himself as ideal king who wanted to make His subjects always happy. The whole program was on the basis of an ideal king. 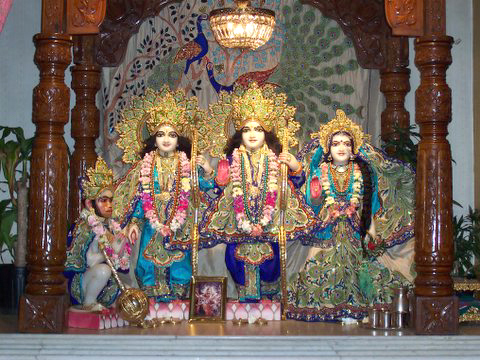 But in the case of Lord Krishna, He played as fully independent Supreme Personality of Godhead. Apparently, therefore he transgressed so many moral and ethical principles. These comparative studies on the life of Krishna and Ramachandra is very intricate, but the basic principle is that Ramachandra appeared as an ideal king and Krishna appeared as the Supreme Personality of Godhead. Although there is no difference between the two. A similar example is Lord Chaitanya. He appeared as devotee, and not as the Supreme Personality of Godhead. Although He is Krishna Himself. So we should accept the Lord's mood in particular appearances and we should worship Him in that mood."